The main crest of the mountains, an impressive mountain ridge of about 45 km long, runs from west to east. It stretches from Şetref Pass to Prislop Pass in Maramureş and Rotunda Pass in Bistriţa-Năsăud, with numerous pyramid-shaped peaks of over 2,000 m. Although the bigger part of the Rodnas is in Bistriţa-Năsăud, Maramureş is the most visited by tourists. There are many streams, lakes and mineral water springs in the Rodna Mountains. The fauna includes several protected or endangered species like the lynx (Lynx lynx), chamois (Rupicapra rupicapra), marmot (Marmota marmota), capercaillie (Tetrao urogallus), black grouse (Tetrao tetrix), golden eagle (Aquila chrysaetos), lesser spotted eagle (Aquila pomarina), raven (Corvus corax), eagle owl (Bubo bubo), and little owl (Athene noctua). Borşa is a town in the Vişeu Valley, between the Rodna and the Maramureş Mountains. 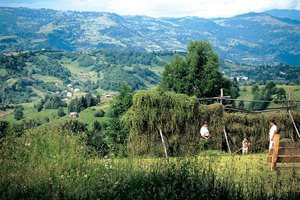 The town is about 80 km via the national road DN 18 from Sighetu Marmaţiei, the last commune in the valley before Prislop Pass that leads on to Moldavia. Borşa is situated at an altitude of nearly 700 m, and it is the most important starting point for treks to the Rodna Mountains. Moreover, it is located between two important protected areas: the Maramureş Mountains Nature Park and the Rodna Mountains National Park. About six km north of Borşa there is the mining settlement of Baia Borşa (Borşa Mine), which until not so long ago used to be an important centre of copper, silver and lead mining. It is part of the town of Borşa. Some km east of Borşa, in the middle of alpine landscapes, there is one of the most important mountain resorts in northern Romania, Borşa Resort. 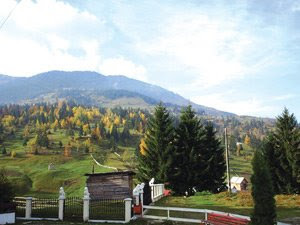 It is situated at an altitude of more than 850 m.Due to the high altitude, evergreen forests and clean air, many come here to be treated for various pulmonary diseases, such as bronchitis. As in many places in Romania, treatments are often based on natural remedies and mineral waters, but here they also include mofettes, i.e. volcanic vents in the earth from which carbon dioxide and other gases escape. Mineral waters with iron, calcium and magnesium are recommended for the treatment of digestive disorders, and kidney and urinary problems. The region is well suited for sports enthusiasts, and hikers can start here their trips to the Rodna Mountains. Moisei is situated in the Vişeu Valley, only some km downriver from Borşa towards Vişeu de Sus at the junction of national roads DN 17C and DN 18. The fame of the village is mainly due to the Moisei or Izvorul Negru Monastery, with a tiny old wooden church. On a low hill at the eastern end of the village, there is the Memorial of the Martyrs, a monumental group of statues realized by the sculptor Vida Geza. The Rodna Mountains National Park is the biggest protected area in northern Romania, and the main object of nature tourism in Maramureş. The park, which covers the whole Rodna massif, extends to the territory of two counties, Maramureş and Bistriţa-Năsăud. Famous in the region are the chamois, repopulated between 1962-1967, and the marmots, colonized in 1973. Because of its diverse and valuable fauna and flora, in 1979 the area was declared a biosphere reserve within the framework of UNESCO’s Man and the Biosphere Programme. There are also numerous traces of the passing of glaciers: alpine peaks and abrupt wild valleys that form spectacular glacial hollows. On the northern slope there are three such hollows: Zănoaga Mică, Zănoaga Mare and Zănoaga Iezerului, separated by the ridges of Turnu Roşu and Piciorul Moşului. Zănoaga Iezerului is the biggest hollow with the oval-shaped Lake Iezer. On the southern side there is the Buhăescu-Rebra hollow, with Buhăescu Mare waterfall and Tăurile Buhăescului, four little glacial lakes. At the western border of the reserve is a laboratory used for scientific research. Tăurile Buhăescului, also called Iezerele Buhăescului, are four small ponds situated in the glacial circus of Buhăescu, the biggest one in the Rodna Mountains. Another protected area in the Rodna Mountains National Park is the Mixed Reserve of the Cave and Blue Spring of Iza, situated in the northwestern part of the massif. The Natural Reserve of Piatra Rea is in the northeastern part of the Rodnas, between the brooks of Cimpoiaşu and Fântâna. The Cascada Izvorul Cailor is the most spectacular waterfall in the Rodna Mountains and the highest one in Romania. Prislop Pass is one of the highest passes in Romania (1,416 m), situated on the DN 18 that leads from Borşa east towards Moldavia. 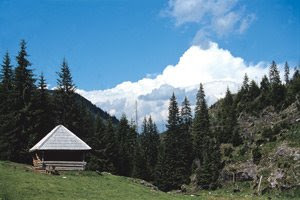 The pass divides the Rodna Mountains from the Maramureş Mountains. Every year, on the second Sunday of August, an important folk festival is held in Prislop: Hora de la Prislop. Folk music and dance groups, as well as spectators gather here from Maramureş, Bucovina and Bistriţa. 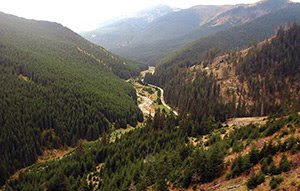 Another important pass in Maramureş is that between the Rodna and the Tibleş Mountains: Şetref Pass, on DN 17C.